Important new HR content consumption insights for B2B marketers to improve demand generation strategies this year. In a new industry report from NetLine Corporation, deep insights into the research patterns of HR professionals have been uncovered. Analysis into the active HR personas, HR content consumption trends, and the most in-demand audiences of HR companies was completed using the NetLine B2B content syndication lead generation network that processed more than 8.5 million leads in 2016. "The profile of active human resource professionals consuming content has continued to both broaden and deepen within organizations this year. Marketers must be mindful of possible opportunities existing between campaign target personas and market realities recognized within the greater HR functional landscape. More often than not, your target 'decision maker' is realistically an aggregate of a number of influencers who help foster the final recommendation within the organization." 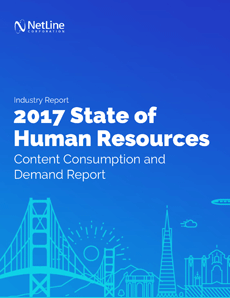 The 2017 State of Human Resources Content Consumption and Demand Report is an important read for B2B marketers of HR solutions and software.